One of the greatest challenges facing us when drawing “from life” is the temptation to draw expectations and preconceptions. 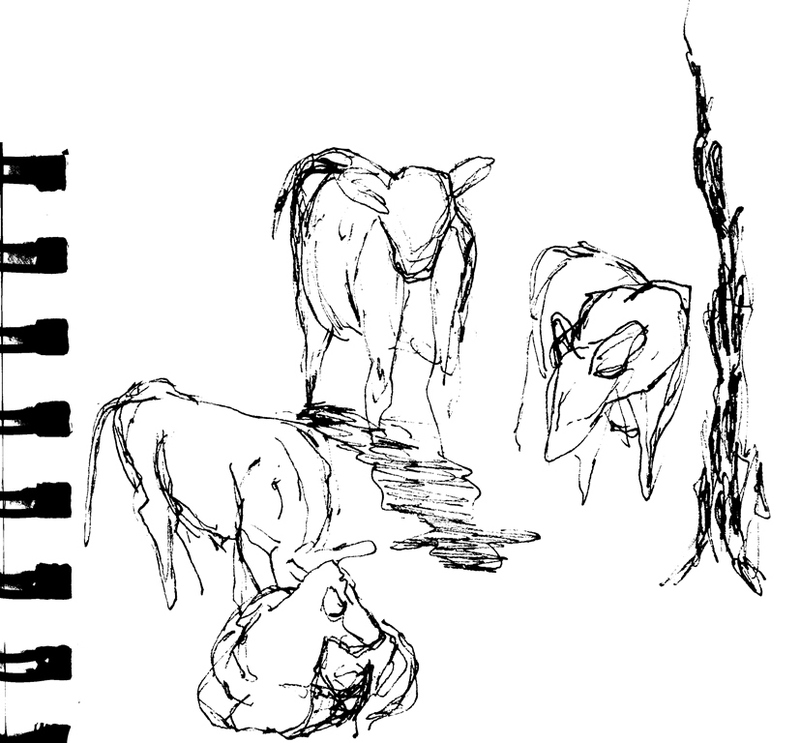 Contour drawing is a method which encourages you to truly see what you are observing. Contour drawing encourages us to concentrate on details and the outline of something at the same time. The subject is drawn in one continuous, connected line, just as contours of a landform are represented on a map. The result is often a little "messy," but also tends to capture the energy or personality of a scene with lots of expression. Drawings are often held to photo-realistic standards. When we release our expectations of making a “photo-perfect” illustration, we tend to have greater success expressing our subject. Contour drawing "levels the playing field", by focusing on observations, on the process, rather than producing picture-perfect illustrations. I learned this exercise from my high school art teacher, and it continues to be relevant for me today. I have also shared it with a lot of people, many of whom maintained, "I can't draw" until they tried contour drawing. Try it for yourself, and see how it goes. Feel free to share comments and images of the outcome! Contour drawings are a way of shifting our mind from the left brain (the technical, analytical part) to the right brain (the part credited with creativity, spontaneity, etc.). Doing so enables us to shift from trying to draw something “photo-perfect” to emphasizing the character, personality or essence (referred to as gestalt) of the subject. Sometimes, making this switch is a bit of work, and perhaps a bit uncomfortable, too. There is no “right” or “wrong” with contour drawing. Contour drawing is a method for drawing “honestly”, rather than just drawing what we are conditioned to “see in our minds”. For example, think of the typical child’s drawing of a tree, versus the many kinds of trees visible in the world around us. Contour drawings help us overcome the habits or symbols we often revert to when drawing. Hand-eye coordination is enhanced, as your mind and eyes direct your hands. Your pen is led along the contours as though you were actually drawing on the subject, tracing every detail. Use blind contour sketching to settle and focus your attention, as it transfers typical sketching focus from what is perceived (pre-formed images in our mind) to what is actually being observed (seeing the true details and form of the subject). Blind contour drawing can also be used to loosen you up at the beginning of a field drawing, or to re-invigorate yourself in the middle of a drawing when you are stuck. 1. Start by observing your subject/object closely (30 seconds-several minutes). 2. Place your subject (a natural object, person, etc.) in front of you, at comfortable angle and distance for focusing on it. 3. Place your drawing materials (paper and pen/pencil) out of your field of view -on your lap, under the table, etc. 4. Then, place your pen on the paper at the same point that your eye is looking at the subject’s surface. 5. Imagine that your eye is an ant crawling over the whole shape. As your eyes travel slowly across the subject, your hand should “follow” your gaze. Using a careful and continuous line, draw the path of your ant as it proceeds around the edges, up and down the wrinkles and folds, and disappears into the shadows (follows the contours) of your subject. 6. 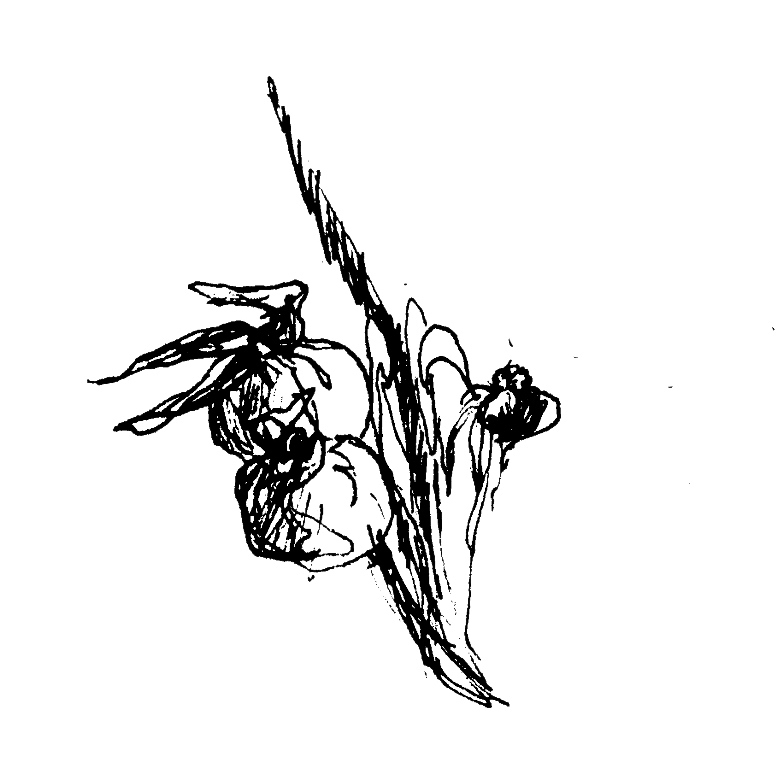 You will use a steady, continuous line, never lifting your pen/pencil from the paper. If you do so, you will lose your place! 7. Essentially, you are drawing with your eyes. 8. As your eyes “draw”, they should move along the outline of the object, but also the internal lines and textures, differences in coloration, etc. Maintain the continuous contour line throughout the drawing, even when you return to a previously drawn part of the subject. 9. Repeat this exercise multiple times, each time allowing a few more seconds, or minutes to elapse while you draw. Occasionally, turn the object, or move to a new vantage point, so that you consider it from multiple angles. This approach graduates from a blind contour. The same procedure is followed, but you may look occasionally at your paper/drawing. However, the majority of the time should be spent looking at your subject, not your drawing. Think 90% subject, 10% paper, maximum. I have developed several extensions to integrate these drawing exercises into the larger practices of nature drawing, location sketching and/or field journaling. Click Here to view extension suggestions. Use this link to follow an audio-visual guide of the blind contour process. This video can be helpful for understanding how contour drawing works, and also as a “facilitator” guiding you in your own drawing. 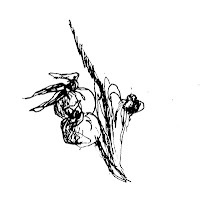 [i] The “blind contour drawing” technique was introduced by Kimon Nicolaïdes in The Natural Way to Draw, and further popularized by Betty Edwards as "pure contour drawing" in The New Drawing on the Right Side of the Brain. [ii] This is third-party content. I cannot vouch for its authenticity. It is provided only as a reference for individuals seeking additional content on this subject. This is fascinating. Makes me want to try my hand at it, although it may be a little late for these arthritic neuropathic hands. Anything that requires tension in my right hand, causes my fingers to get numb. Signing my name yields a potpourri of results. Maybe I should try contour drawing my signature! I love what you are doing B!!! Those folks are so lucky to have this class with you! This was fun - I'm smiling. It made me want to go outdoors and try it. You should tell your art teacher, if you haven't already. of results. Maybe I should try contour drawing my signature! B!!! Those folks are so lucky to have this class with you! your art teacher, if you haven't already. Thanks for this, Bethann. I will try to find some time each week to practice this technique. Thanks! It made me look at nature drawing, and all drawing types, differently - very informative! I used this with two groups I taught this weekend at Harvard Forest, and even though I'm not an artist, they thought I was! Thanks for the resources.